Hello my lovelies! 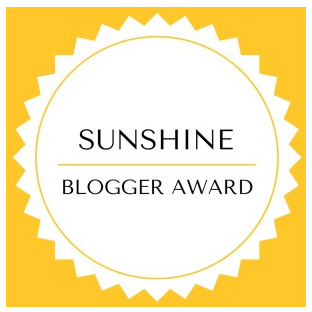 Today I'm honored to be sharing answers from Kim at Fierce Fashion for the Sunshine Blogger Award! Thank you Kim for recognizing Granola & Grace as a blog that inspires positivity and joy. Sending you the biggest of cyber hugs and thrilled to share answers to your posed questions. And what's up with the strawberries? 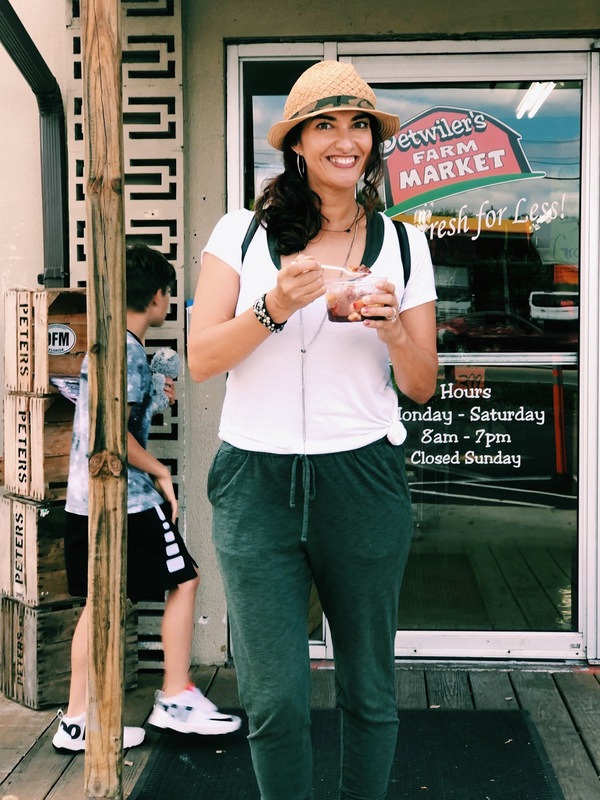 Well, in light of some of those questions I thought it would be a great opportunity to give a mini-highlight to my favorite local market - Detwiler's! Now before I move on to those questions, allow me to introduce you to Kim! Kim is not new to the blog world, but she is new to fashion blogging though you wouldn't know it! She has a fun, sassy and colorful style that is both creative and eclectic. She's friendly and likes one specific drink at Starbucks, though for the life of me I can't remember which one it is! Man, I get hung up on titles, names and mission statements. However, this one came easy for me. 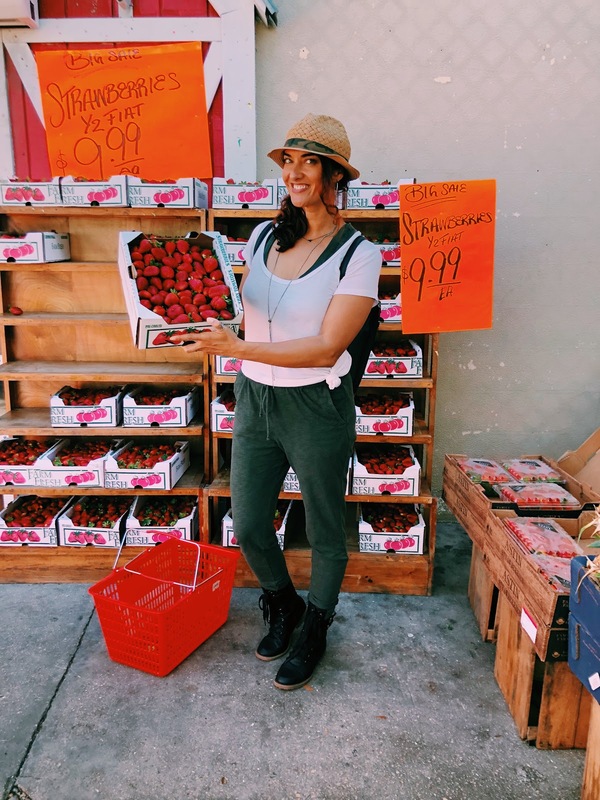 For one, I like alliteration and two, I started this blog during the peak of my healthier living lifestyle. I had changed out my shampoos, soaps, household cleaners, groceries, etc for "clean" products when it wasn't a "thing". My friends lovingly (I think -ha!) called me a tree-hugger and I embraced it. 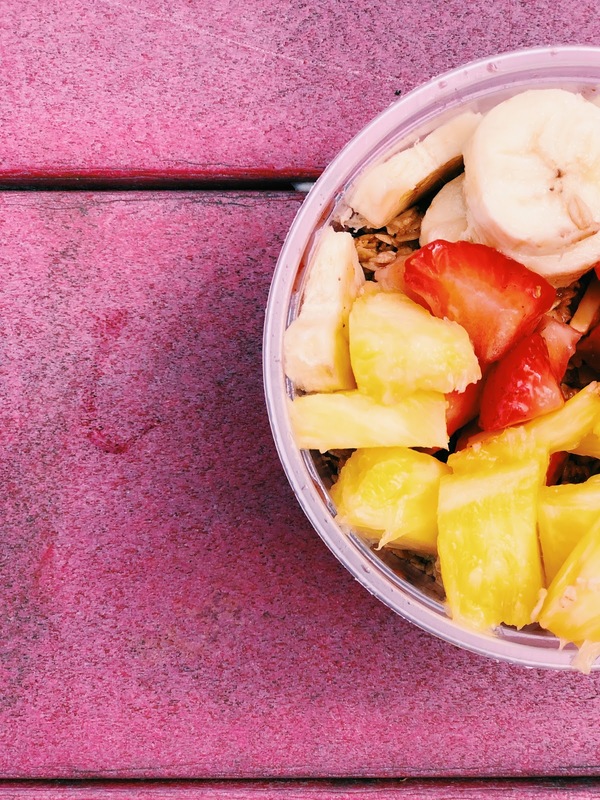 That's where the GRANOLA comes in. However, I didn't and couldn't be 100% organic or "clean eating". Mix that with a growing sense of amateur style, a fear of putting myself out there b/c I felt outwardly and physically flawed, and a faith that I base my life on and you get the GRACE. I would say digging into my new community to feature local hotspots or hidden gems and adding videos to my YouTube channel! My love for local and small business owners began with an incredibly special cupcake shop (Yeah, Splat. I miss you tons!). They taught me a lot about the importance of supporting local! 3. Is there a blogging event you would like to attend? What would you like to accomplish? Yes! In fact, I was just there AND met Kim in person! You can read all about that HERE! I didn't know what to expect, but I'd say I was more than pleased and so glad I went. I had hoped to learn more about navigating my little corner in cyber space. Check. However, I didn't expect all the fabulous swag and the wonderful contacts that I left with! Oh man, that's a tough one because I can't pinpoint one. Outside of the blog world, my MIL has been a huge inspiration, as well as "supporter". That sweet woman has added lots to my closet. I'm tremendously grateful! As for the cyber blog world, there's not enough time or space to list! 5. If you could work with any brand, who would it be and why? Oh boy! Superseed Well, formerly known as Guiltless Goodies, in the food department! I'm a relational person, even in business and find myself attracted to smaller business owners with big heart. And this company has a unique superfood snack that I love, as well as HEART! As for fashion, I'd be hard pressed to choose between Altar'd State, GAP, Lucky or LOFT. 6. How far in advance do you take photos and plan blog posts? I have a basic outline from week to week that I follow. For instance, Monday Motivation, Wednesday Style Adventures and Friday Features and Favorites. However, I sit down at the beginning of the month and add in posts based on prompts, link ups, and items or products sent to me for review. As for those photos, I have to take them when I'm able. My photographers are my homeschooled, 9 year old twins. This keeps the adventure in my day AND in my blog. I never know how photos will turn out but I wouldn't change a thing! Perfect example: I thought one of my boys was posing with me in the photo below while the other took the shot. He was in fact, resting his "Flipper" koala plush on my shoulders. Yeah, he wasn't even in the picture! 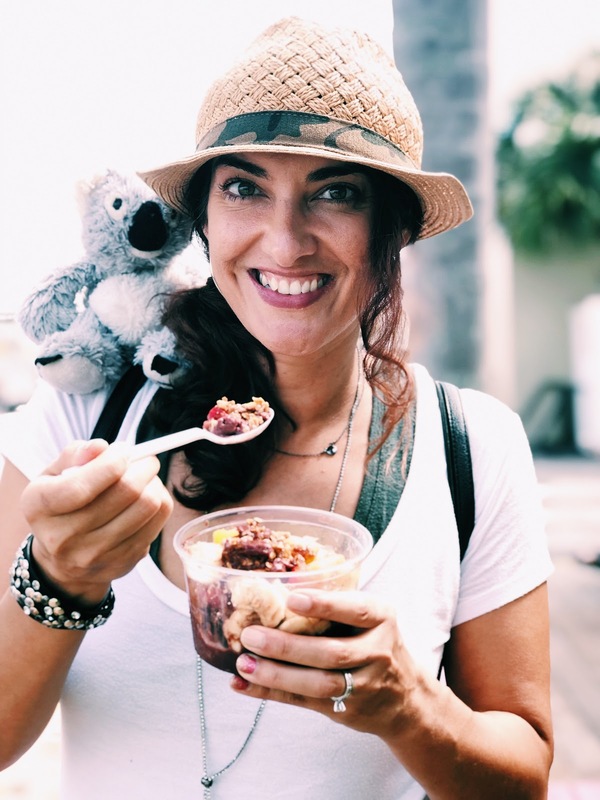 So I give you me, Flipper, an açaí bowl and me! Now I get to nominate a few bloggers to answer questions of my choosing! My apologies if you've already been nominated - I tried to research a bit, but it's getting late, you know!! Thank you for reading along! As always, I love to hear from you! Congrats Chrissy on receiving this award and I enjoyed reading your answers! Your photos always turn out so well and I am so impressed with your photographers! Now I need to get busy answering those questions you posed! Thank you so much Kellyann! It’s hard not to compare to the talents of others when it comes to my photography so you’re comments are encouraging! Can’t wait to read your answer my friend. Kim, those are some of the kindest words! Appreciate you so much and look forward to reading about your adventures as you move into the next “new” season! I loved reading all about these answers Chrissy. It's funny because where I went to school in Boulder, the term Granola is used all the time. So I totally got that!! I adore that your twins take your photos. Seriously, you are training them for the world!! Thank you! Let’s hope I’m training them for something! And now i want to visit boulder Colorado! Congratulations on receiving this award! I enjoyed reading your answers! I'm looking forward to when my oldest daughter can take my blog photos! Thanks for the nomination! It was so sweet of you to think of me and my little blog! Thank you Laura! Love your style and genuine smile blog! And i indefinitely think that you guys would have fun adventures. I’m no most comfortable goofing off with these guys. Thank you Lisa! Only trouble comes when someone thinks your name is "Granola". haha! Biggest of hugs to you. :) I do love getting out and meeting my neighbors. hehe. Yay!! Thank you so much Chrissy for the nomination! I didn't see a deadline, so whew!! I've got some time to think about and write my post! Love you beautiful friend. I hope you are already enjoying your weekend in sunny Florida! Such a great post, Chrissy! And no surprise that you have been given this award multiple times! And another thing you and I share is our passion for supporting local businesses and spreading the word on our blogs! It is one of my favorite things to do. Support who I can, when I can. It just makes everyone feel great, doesn’t it?! Yes! You are so right about that. I think you just can't help but get to know the faces behind the business and want to support their dreams mixed with hard work. Ahh - thanks for the shout out - I'm totally going to use your questions & pass on the blogging love!!! Yay! I can't wait to read your answers. :) ANd haha, hurry Daily Grace...she's waiting! Awe! Thank you so much for nominating me. That was so sweet! First of all, congratulations for being nominated Grace! You bring so much sunshine and positivity to the blogging community, it is wonderful. Secondly, this was such a fun post to read and get to know you more. Love that your twins are your photographers. Seriously, way awesome. One of my goals this year is to learn more about my camera but since got a five year old tag along, I am also teaching him how to take photos. Pretty cool if you ask me even if my head is cut off 99% of the time. Lastly, thank you so much for the nomination. You are the sweetest and I am so thrilled! With feeling uninspired lately, this came at a good time. So, thank you. I hope your week is off to a great start and happy Tuesday! Awww! thank you so much Maureen. Your comment made my day. In fact, I've read it a couple of times. I love that your teaching your boy to use the camera. it is a fun adventure if they enjoy it. I can't wait to read your answers!